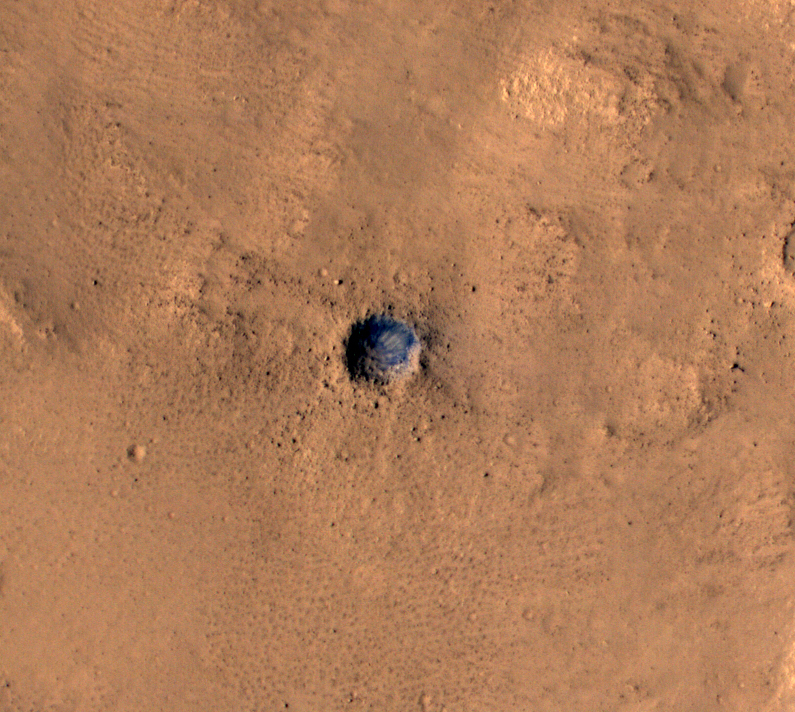 Today's Image of Mars was taken in early 2007 by HiRISE after there was speculation that this crater was the landing site of the lost Beagle 2 lander. The Beagle 2 lander detached from the Mars Express orbiter in December 2003, but all communication was lost with the lander six days before atmospheric entry. Because there was no telemetry being sent back during its descent scientists cannot be sure where is landed. It is unlikely that the entry, descent, and landing sequence (EDL) was nominal, but just in case, the HiRISE team has been examining the area it was expected to land in hopes of finding it. They suggest that the probe was lost because of cruel luck as it touched down in one of the worst possible places for a soft and successful landing. Rather than dropping to the surface on a flat plain, it appears to have first struck the downslope of a small crater about 18.5m (60ft) in diameter, before crashing into its opposite wall, bouncing several times around the rim and eventually coming to rest at the bottom. Even if the gas bags that were meant to cushion its impact were fully inflated, and there is some evidence that they were not, their design would not have allowed them to protect the probe properly under these unlikely circumstances. Unfortunately these claims were unsubstantiated, as you can see from the below image of the crater in question. To this day the HiRISE team has continued to look for all the lost Mars landers, including Beagle 2 in hopes that finding them would help to understand the reason for the malfunction and allow future missions to be better prepared. To see surface images of all the successful Mars landers and learn about the easiest way to identify a lander simply click here or on the image below.